This square shaped Art Deco ring is intriguing. 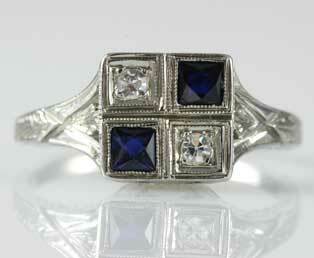 The top of this ring features a checkerboard pattern of alternating blue sapphires and white diamonds. Adorning the sides of this ring are wheat engraved designed bands. This Art Deco ring is crafted in 18kt (750) white gold. This estate Art Deco Ring is in excellent condition.